November 9, 2013 Jordanian authorities on Saturday prevented Majed al-Zeer, the director of the Palestinian Return Centre , from entering Jordan without disclosing the reason, the head of Jordan Palestinian Return Centre, Kadim Ayesh told Ammon News. Ayesh denounced preventing Al Zeer from entering the country, cited that Zeer holds Jordanian citizenship, and he was supposed to attend the second conference for ‘return’, at the Professional Associations’ Complex. As reported by the GMBDW, al-Zeer was one of the participants in a ““Workshop on the situation of Palestinian refugees of Syria” held on November 11 at an Istanbul hotel by the Global Muslim Brotherhood. The Palestinian Return Centre (PRC) itself has many ties to the Global Muslim Brotherhood/Hamas. Current and past PRC directors have also been directors of the Muslim Association of Britain (MAB), a part of the U.K. Muslim Brotherhood. The PRC is also as an affiliate of the Muslim Council of Britain (MCB) which frequently acts in concert with U.K. Muslim Brotherhood groups and PRC activities are often promoted by the MAB, MCB, and other U.K. Brotherhood organizations. PRC director Ghassan Four is also a Trustee of INTERPAL, a key member of the Union of Good, a coalition of charities headed by Global Muslim Brotherhood leader Youssef Qaradawi and which helps to raise funds for Hamas. 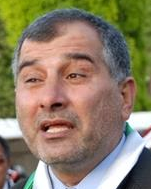 Arafat Madi (aka Arafat Madi Shoukri), identified in the past as the Executive Director of the PRC, is also the chairman of the European Campaign to End the Siege of Gaza (ECESG), one of the main sponsors of the Gaza flotilla movement and also tied to the Global Muslim Brotherhood. PRC director Zaher Birawi is a Trustee of Education Aid for Palestine (EAP), also a part of the Union of Good. Mr. Birawi has also been the head of programming for Al-Hiwar TV which frequently features MB/Hamas individuals and organizations and was founded by Azzam Al-Tamimi, a U.K Muslim Brotherhood leader and close to Hamas. Mr. Birawi is also reported to be one of the three PRC trustees discussed earlier who are Hamas activists that found refuge in Britain in the early nineties”In December 2010, the israeli government declared the PRC to be an illegal organization stating “the Center functions as Hamas’s organizational branch in Europe and its members are senior Hamas leaders who promote the movement’s agenda in Europe, and directly interact with various Hamas leaders, particularly from Damascus.